There are many different reasons why you will want to purchase a new Monaco recreational vehicle for your first RV- the Monaco recreational vehicle manufacturer has been rated consistently top of its line of motor homes, or the Monaco recreational vehicle family you immediately become a part of with the magazines and special VIP clubs, or even because of the one of a kind Cummins engine and chassis the motor home is built on. Well, above and beyond the details of the above mentioned reasons why you will want to buy a Class A recreational vehicle made from Monaco is for the sole reason that it screams luxury in every way, shape, and form! There are ten Class A Monaco RVs (Signature, Executive, Dynasty, Windsor, Camelot, Diplomat, Knight, Cayman, Lapalma, Monarch SE) and one Class C (Esquire). Each is uniquely luxurious and special in its own alluring way. Each RV is built with a Cummins engine and a one of a kind “Panaview”, which is the one piece panoramic front window. What do you think of when you imagine a luxurious home away from home? What does your mind dream of as you begin to think of your new life on the road? Aside from the solid and powerful way the Monaco recreational vehicle is built, the opportunity you have to go above and beyond in extravagance is exciting. Each amenity or option may be particular to the name/style of the Monaco recreational vehicle you are looking at. The following are a few of the reasons a Monaco recreational vehicle should be the luxury motor home you choose. Living in a beautifully constructed Monaco recreational vehicle body –sunscreens, slide-out living space, slide-out storage space, voice activated turn signals, and even Monaco mud flaps. The construction of the actual body of the Monaco RV is of the highest quality, utilizing both storage opportunities and technological advances. Sitting behind the wheel in the Monaco cockpit – GPS navigation system, powered sun visors, extra wide seats with foot rest, CB and antennae. Both the driver and the co-pilot have gadgets and control panels to work with. Spending your days and nights with the Monaco high-end appliances – four door refrigerator, flat screen television in both the bedroom and the living room, universal remote system, dish washer, stacked washer and dryer. The Monaco appliances are fun, practical, and make living away from a “real” home as pleasant as ever. Waking up and falling asleep to the exquisite interior fashion – real wood cabinets, clothes hamper, drip less edge counter tops, tile and carpet, hand wall papered, bay window in living area, bath tub, special ceiling and carpet designs, and even Ralph Lauren décor. The interiors created by Monaco are fit for whatever style you like, whether it is ultra modern with buffed stainless steel or ultra conservative with country-style tiles and curtains. Relaxing while on the road with the fancy Monaco furniture – the Monaco recreational vehicle offers fine furniture to fit your on the road lifestyle, such as king bed, queen air mattress for your Monaco recreational vehicle, roadside and curbside recliners and loungers, computer desk in bedroom, legless or booth style dinette, sleeper sofa, cutting board, and an open or closed bath. The furniture matches the wide array of Monaco floor plans. The fit is practical, functional, and luxurious all at the same time. Safety satisfaction – fire extinguishers, dead bolt on front entrance, security safe for your prize possessions, smoke detector, and security alarm system. Safety speaks for itself. 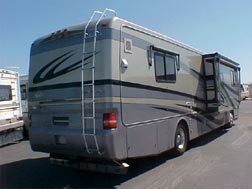 The Monaco Class A motor homes often offer dual fill ups on either side of the motor home, so you will always be able to pull in and pull right up to a gas tank. The motor homes offer roomy, extended living space with both storage space and head room. Monaco offers control panels for both the driver and the co-pilot, so everyone has something to play with and be in control of. The furnishings, the space, the high-quality construction are all simple reasons of examples as to why and how the Monaco RV will prove to be the most luxurious motor home you can find for your first recreational vehicle purchase.